Blood mimics air, it augments in springtime, it is characterized by the warm/humid attribute, it dominates man's childhood. Bile mimics fire, it augments in summertime, it is characterized by the warm/dry attribute, it dominates man's adolescence. "When Adam sinned, the yellow bile turned into bitterness and the black bile into the darkness of God's absence. The moment when Adam broke the divine commandment, the black bile was condesned in his blood. This happened in the same way luminance is lost once we blow out the candle and only the glowing wick and its stench remains. This is what happened to Adam. For, once the light inside him went off, the black bile was condesned in his blood and sadness and desperation were stirred inside him, because, in the case of Adam, melancholy was swarmed inside him by the devil." Black bile mimics earth, it augments in automntime, it is characterized by the cold/dry attribute, it doninates man's adulthoood. "As for the black bile which, in its natural state, is cold and cannot be found on the surface, if it is in excess inside the body, it causes apoplexy or torpidity or mirthlessness or fear. If it is overheated, it causes conviviality accompanied by singing and ecstasis and rashes and other things alike." Phlegm mimics water, it augments in wintertime, it is characterized by the cold/humid attribute, it dominates man's elderly age. "Man's body has blood, phlegm, yellow and black bile inside it: these constitute human body's nature and on those pain and health lay their principle. Therefore man is healthy when, mainly, these components are mixed with the right analogy of attributes and of quantity and when the mingling is perfect. Contrary to this, pain is provoked when one of these are in a smaller or bigger quantity or it lays separate inside the body and is not mixed with all the rest." The performance draws its initial inspiration from the letters from the prison sent by the Marxist revolutionary Rosa Luxemburg to Sonia Liebknecht between 1917 and 1918. Scattered impressions of Baudelaire's "Fleurs du mal" at an appartment in Exarheia, Athens. Sunday, Monday, Tuesday, Thursday, Saturday / 9.15 pm / Duration: 60 min. The homemade performance Ectoplasms, a strange "poetry night" inspired by splatter movies aestetics, will be presented in September in Leipzig and Dresden at the Off Europa Festival. Nova Melancholia is active inside the ever-changing space of theatrical and visual arts performance since 2007. The collective attempts a non-systematic mapping of various aesthetics, strategies and texts that have contributed to the configuration of today's melancholy. Nova Melancholia follows non-linear narrations and open dramaturgies. It uses the image-creating method of montage. Often parallel actions co-exist, actions that are seemingly non related to each other, and which create a multi-perspective landscape. Nova Melancholia uses poetry, essays and other non-theatre literature as material for its work. The produced outcome is rather a hybrid which oscillates between visual arts, choreographic performances and self-reflective staged lectures. The aesthetic strategies often include camp and/or gender identities as means of queering the spectator’s experience of the work. This gesture has the ambition to place itself within the current discourse on the political and its relation to today’s artistic product and its work ethics. Since 2010, Nova Melancholia walks along with other collectives (Institute for Live Arts Research |Π|, the Mavili Collective, the Omonoia Collective, Green Park), actively participating in their function (organization of conferences, joined claims to the State, occupation of the EMBROS theatre, Green Park occupation). We believe in the cooperative and public nature of art because we feel that thus its inherent social and political role gets empowered. Networks of collaborations that are being weaved around and with Nova Melancholia produce politics through forms and not through declarations. 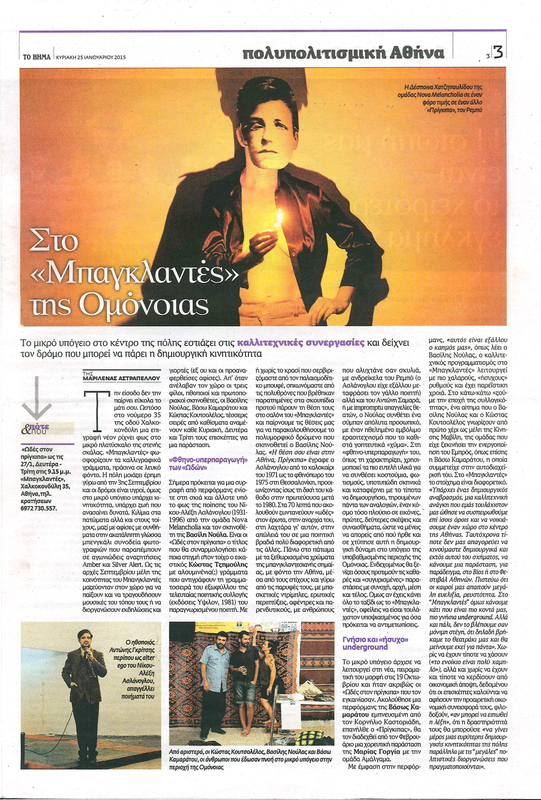 Nova Melancholia's performances have been presented in: Athens Festival, Greek National Theatre, Onassis Cultural Centre, the Athens Biennal, occupied theatres, self-organized site-specific venues, BIOS / Athens, Panta Théâtre / Caen, UM Gallery / Prague, Lofft / Leipzig, Societaetstheater / Dresden, Fivizzano 27 / Roma, Teatro Rasi / Ravenna. The collective has received funding several times by the Greek Ministry of Culture. 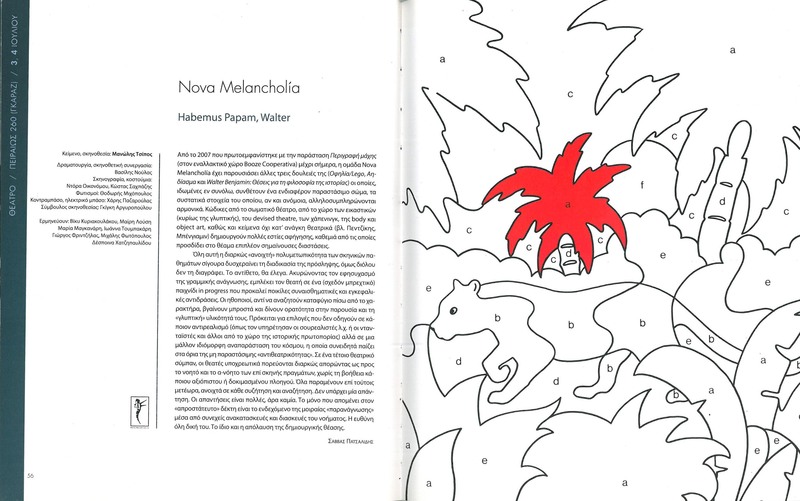 Nova Melancholia received a special Μention for the DESTE Foundation Prize 2013. Manolis Tsipos’ text “Still Life. For the Glory of the City” has been staged in the official Avignon Festival 2014. He was born in 1979 in Athens, Greece. He is active in the contemporary performing arts field as maker, dramaturge and writer. In 2015-2016 he participated as a choreographer at the Research Studios #2 at P.A.R.T.S. His staged work (performance/choreography) has been presented in Greece and abroad, in various contexts (festivals, biennials, conferences, site-specific). He is founding member of the performance collective “Nova Melancholia” - in which he has been an active member until 2011 - and of the Institute for Live Arts Research |Π|, both based in Athens. He holds a MA degree on Environmental Sciences and Politics [1997-2002]. He is a DasArts alumni [2010-2012]. In the past he has been the Mentor of the 3rd year students of SNDO in Amsterdam [2012–2015]. Often he works as performance/dance dramaturge for other artists. He also moderates workshops on the DasArts Feedback Method, internationally. As awarded writer of prose and poetry, his hybrid texts have been presented in the Avignon Festival IN, FRASCATI Amsterdam, the Greek National Theatre, the Athens Festival and elsewhere. Texts of his have been published in Greek and French. He was born in New York in 1975. He is a theatre director and visual artist based in Athens. He is founding member of the performance collective Nova Melancholía. In his work, he attempts to re-approach elements of the Greek and the European traditions of "melancholy", hence gradually constructing his personal spiritual genealogy. Recent projects in theatre/performance: The Dead Man (text by Georges Bataille, Onassis Cultural Centre - Athens 2016), Ectoplasms (poems by Miltos Sahtouris, UM Gallery - Prague 2016), Still Life. For the Glory of the City (text by Manolis Tsipos, BIOS - Athens 2015). He graduated from the Department of Drama Studies (University of Athens), he received a Master degree in Theater-Performing Arts (University Paris III) and he graduated from the Athens School of Fine Arts. He is founding member of the Institute for Live Arts Research |Π|, of the Mavili Collective and of Kolektiva Omonoia– a variable group of theorists and artists. Four books of poetry and prose of his are published by Gavriilidis Editions, in Athens. She was born in Athens and works as an actress, director and teacher. She has a BA in Finance Management and Banking from University of Piraeus, a BA in Acting from Santa Barbara Drama School and a MA in Performance Making from Goldsmiths's University of London. She has co-founded Nova Melancholia in Athens (2006) -of which she is basic performer- and Vacuum Theatre in London (2012), where she acts, directs and writes. During 2017, she performed in the "Age of Innocence" by Doukas Kapantais at the Onassis Cultural Center and in "Maritime Hot Baths" by Ilias Papadimitrakopoulos at Athens' Festival, both productions of Nova Melancholia. She also directed "Yvonne, the Princess of Bourgoundy" by Witold Gobrowicz, perforemed by Vickings, a group of students of hers. Finally, she presented at Battersea Arts Centre in London her last work which she co-created, co-starred and co directed with Kit Redstone, which is called "Pootopia"! She was born in Athens in 1975 and still lives and works there. She is an architect and a teacher. She studied Architecture in Thessaloniki and received a master degree in Urban Studies in Paris. At the moment she studies once more in the postgraduate program Cultural Management in Athens. She teaches design and history of art in the secondary education and she works with student theater groups. In the past she has participated in architectural and urban projects. She is member of Nova Melancholia theatre company since 2006 as a graphic designer and more. She was born in Kavala in 1971. She lives in Athens and works as an actress while teaching motion and contact improvisation. With her work she aims to the expression of personal freedom, grounding - consciously and without limits - in the body any other mental or spiritual impulse that arises during the creative process. She studied film directing at the Stavrakos School and acting at the Akis Davis theater workshop. Brought in the modern theater and improvisation by Roula Pateraki and Mirka Giementzaki, she studied the relationship between body and voice. She studied release technics next to Christina Kleisiouni, conscious movement, improvisation and contact improvisation. Trained in Authentic Movement (3 year program) by Helen Levidis. She creates shows of motionimprovisation and authentic movement with the "3=4" company. She collaborates as a dancer with the 'Helix' company. She directed and dramatized 5 traditional Greek tales in the show "And if you believe it", funded by the Ministry of Culture. She has choreographed the show "Cut project" for "Entropy" theatre in Berlin and Athens with the support of the European Cultural Foundation (ECF). He played in the movie "Thief or Reality" of Antoinette Angelides and was nominated for the National Actress Award at the Thessaloniki Film Festival in 2001. She collaborates with Nova Melancholia since 2007. She is a visual artist based in Athens. Dora Economou visits places, text and materials she has had a relationship with, either literal or fictional, takes samples and builds them into sculptures. She contemplates on whether their memory can still be recognized once their evidence has been removed. She has presented four solo shows in Athens (A Modern Hug : 2013, By The Spring Of Production : 2011, Dekapedaugustos : 2007, The Lost State Of Grace : 2005) and participated in group shows nationally and internationally. Selectively: LUSTLANDS AT Family Business, NY (2013). After Abstraction, Greek Art Institute (2012). 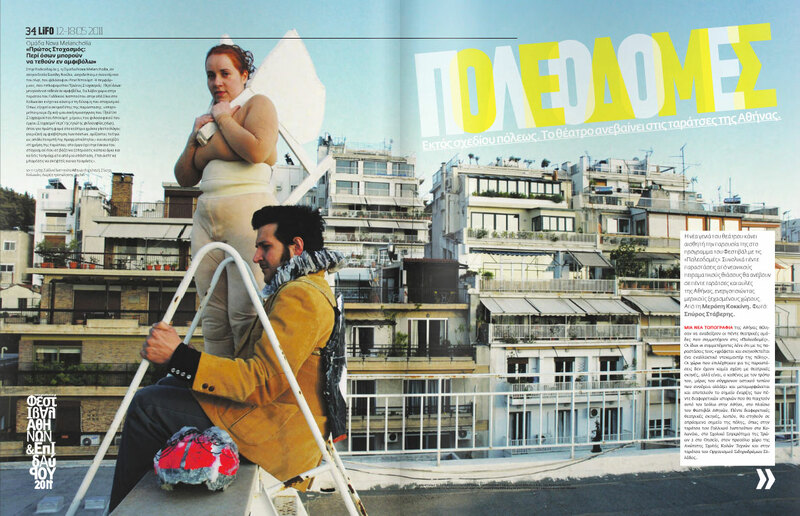 Monodrome: Athens Biennial 3, Greek art, Sem-Art, Monaco (2011). Cabinets of Miracles, Zone D, Athens (2010). Strutture Precarie, San Vito al Tagliamento, Italy (2009). Point of Origin, Artspace Visual Arts Centre, Sydney, (2008), In Present Tense, Young Greek Artists, National Museum of Contemporary Art, Athens (2007). Art Fab 'Women in Europe', Saint Tropez (2006), 4th Deste Prize, Deste Foundation, Athens (2005). So much…so great…, Larissa Contemporary Art Center (2004). In March 2013 she started the fanzine “Kypseli”. She collaborates closely with the performance group Nova Melancholia and the choreographer Kostas Tsiukas . He is a visual artist based in Athens. In his work he experiments with various mediums such as sculpture, video, photography, performance and publications. His work evolves around the issues of boundaries between private and public, home and city, inside and outside. The exploration of the boundaries has been primal in his work, in a conscious but mostly subconscious level. He seems to be attracted by places or areas that stand in-between two contrasting situations. He has presented three solo exhibitions (Contemporary Art Gallery of Pancevo, Belgrade, 2007. ArtisCausa Gallery, Thessaloniki, 2008. Green Park, Athens, 2015) and he has participated in many group exhibitions and collaborative projects in Greece and abroad. 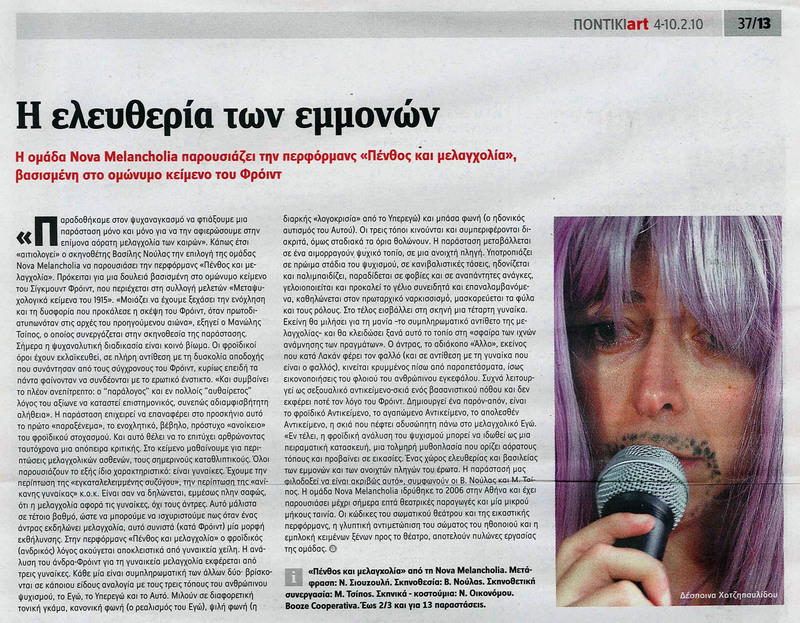 He was co-organizer of the Performance Biennial "No Future" in Athens and Cythera in June 2016. Since 2014, he collaborates closely with the performance group Nova Melancholia. Vassilis Noulas receives the queer theatre award for best direction for the performance "The Age of Innocence". 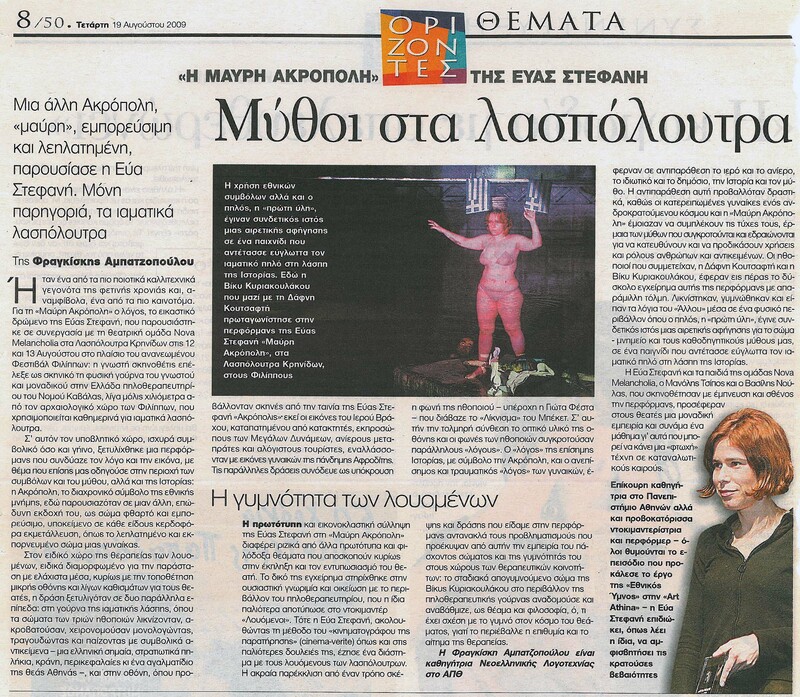 For the same performance, Despina Chatzipavlidou is nominated for best actress and "to koritsi koimatai" for best music composition - song. Manolis Tsipos' text "Still Life. For the Glory of the City" is staged at the official Avignon Festival 2014 directed by Michel Raskine and translated into French by Myrto Gondicas. Extended excerpt of Still Life. For the Glory of the City by Manolis Tsipos in the anthology "Contemporary Greek Writers" [fr] translated into French by Myrto Gondica. "Radio Show: Spiccato" [gr] Vassilis Noulas discusses with Nina Rapi about "what is this that we call queer"
Congress "Politics of the Applied: Theatre and Art as Intervention"
After the proposal of the Selection Committee of this year's Prize, a performance from the Nova Melancholia collective will be presented in the context of the exhibition, a collective that is defined by its multi-leveled and hybrid language. Nova Melancholia presented the performance-announcement "Adieu to Emmanuel Levinas" during the exhibition's opening. "Three Belgian Cities" with thirteen photos from the Super8 film "Journey to Buenos Aires"
Vicky Kyriakoulakou is candidate for the "Melina Merkouri Theatre Prize", for her acting in the Nova Melancholia performance "Meditation I: Concerning Those Things That Can Be Called into Doubt". NEA ESTIA ► SABINE X.
Α΄ Prize at the Playwright Contest for young people up to 35 years old, for Manolis Tsipos' "Sabine X.". The Prize went with the award €10.000. "Sabine X." was staged at the Greek National Theatre in May 2009. Participation with the performance "Disgust" at ATHENS SYSTEM 2008 [en] of the Hellenic Centre of the International Theatre Institute (ΙΤΙ). Prize for feature film script to Manolis Tsipos, for the script "Popesse Ioanna", based on the same titled text by Emmanuel Rhoides. The prize went with the award of €10.000.